General Data Protection Regulation (GDPR) is effective in Europe (including UK) from 25 May 2018. 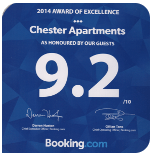 Chester Apartments / Freetobook has always wholeheartedly supported data protection and transparency. As a family run business we have always known the value of trust, so you can be sure that we will only use your data as outlined in our Privacy Policies. Chester Apartments / Freetobook is booking software used by accommodation providers to enable their customers to make online bookings and manage those bookings. This document applies to the processing by Chester Apartments / Freetobook of personal data collected by properties using Chester Apartments / Freetobook online booking system in relation to the provision of accommodation by those properties. Properties using Chester Apartments / Freetobook as their booking engine, collect and store information that you give when you make a booking. You are asked for your name, address, telephone number and email along with payment information and “the names of any guests travelling with you”. This may also include your IP address. This information is stored in the Chester Apartments / Freetobook System in order to process your booking. You may be contacted by the Property you have booked with in relation to your booking. Your data is also stored after you have stayed but will be kept no longer than necessary in order to comply with legal obligations and for properties to welcome your repeat business. If you provide payment information, this will be processed directly by secure PCI Level 1 compliant payment gateway providers. In the context of providing booking software to accommodation providers to facilitate online booking, Chester Apartments / Freetobook and the accommodation provider shall together operate as joint data controllers for the processing of your personal data. In accordance with General Data Protection Regulation (GDPR), Chester Apartments / Freetobook observes reasonable procedures to prevent unauthorised access and misuse of personal information. We use appropriate business systems and procedures to protect and safeguard any personal information given to us. We also use security procedures and technical and physical restrictions for accessing and using the personal information on our servers. Only authorised personnel are permitted to access personal information in the course of their work. You have the right to access data that is stored on behalf of properties taking bookings via Chester Apartments / Freetobook system. You need to email or write to the property you booked with to request an overview of your personal data. You can also contact the property you booked with on Chester Apartments / Freetobook System if you believe that the personal information they have for you is incorrect, if you believe that they are no longer entitled to use your personal data or if you have any other questions about how your personal information is used or about the Privacy Statement. You need to email or write to the property you booked with. You may also be asked to send feedback after your stay in order for the property to further improve their service. Your email address will be used for this purpose. If you complete a review it may be posted on the property website, facebook page, twitter or google plus. However, no identifying details will ever be attached to a review posting. Performance of a contract. The storage of your information may be necessary to perform the contract that you have with the accommodation provider you are booking with. Legitimate Interests. We may use your information for our legitimate interests, such as for administrative, fraud detection and legal purposes. A cookie is a small amount of data that is placed in the browser of your computer or on your mobile device. These cookies are used only to help you make a smooth booking and contain information like the date searched and language of booking. There is a difference between session cookies and persistent cookies. Session cookies will only exist until you close your browser. Persistent cookies have a longer lifespan and are not automatically deleted once you close your browser. We use persistent cookies in Google Analytics to analyse visitor traffic and behaviour.